BETWEEN SOCCER GAMES. 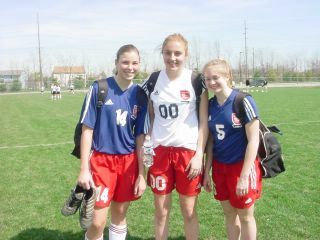 Molly (on the right), with two Arsenal teammates, poses for a photo after a tough morning game. They played a second 80-minute game in the afternoon. Sam also played this afternoon with this Indy Burn team.